1.1 What is Singleton Design Pattern? Java has several design patterns and the Singleton Pattern is the most commonly used. 1.1 What is Java Singleton Design Pattern? Static Member: It will create a single instance in the JVM memory as static are class level variables. In the Java programming language, there are different implementations of the singleton pattern. But before we start, the singleton design pattern should be considered only if all the three criteria’s are satisfied i.e. Over here is the classic implementation of the Singleton Design Pattern. // If there is no instance available, create new one (i.e. lazy initialization). This example is known as Lazy Initialization – which means that it restricts the instance creation until it is requested for the first time. Here represent some significant scenarios where the singleton design pattern is used. Note: If a Singleton class is loaded by two classloaders, two instances of the Singleton class will be created (i.e. one for each classloader). In this section, we will explore the strategies that can be adopted to improve the Singleton design pattern. In eager initialization, the instance of the singleton class is created at the time of class loading. This approach offers the easiest execution and helps improve the runtime performance of the application. Here is an example of Eager Initialization singleton class. // Making the "instance" attribute as "final" ensures that only one instance of the class exists. This approach is similar to lazy initialization, but it has a drawback i.e. the instance is always created even though the application is not utilizing it. This is considered a destructive practice for creating the database connections or sockets as it may lead to memory leak problems. The implementation of static block initialization is similar to the eager initialization, except that instance of the class is created in a static block that provides an option for the exception handling. // Static block initialization for exception handling. Prior to Java 5, Java memory model had many issues and the developers had to use the Bill Pugh Solution for implementing the Single design pattern in their applications. This approach is based on initialization on demand idiom and uses the Inner classes’ concept. Here is an example of Bill Pugh Solution singleton class. To a degree, Bill Pugh Singleton has been the good approach, but it is easily destroyed through the Java Reflection API. Hence, this approached was not heartily recommended by the Java developers. Enum was introduced in Java 5 and provides a thread-safe implementation. The objects returned by Enum are Singleton in nature and therefore can be effectively used for implementing the Singleton design pattern in the multi-threaded environment. // The singleton instance can be accessed via "SingletonEnum.INSTANCE". This approach is easy but it has 2 drawbacks i.e. Consider a scenario if two threads try to create an instance of a singleton class at the same time. In a multi-threaded environment, there is a possibility that separate objects get created, due to different times of accessing the (instance == null) check. This will break the singleton principle. The simplest way of achieving the thread safety in the singleton design pattern is to make the getInstance() method synchronized. Here is an example of the Thread-Safe singleton class. // Only one thread can execute this at a time. At this location using the synchronized keyword will ensure thread-safety but the application performance will be degraded. So at one side, we are resolving the problem on another side we are creating one more. To solve this, Double Check Lock principle is used. The locking mechanism in the singleton design pattern causes the thread to get a lock on the getInstance method only when the instance is null. This prevents the unnecessary synchronization once the instance variable is initialized. Here is an example of a Double Check Locking singleton class. // Double check locking principle. // To provide thread-safe implementation. // Check again as multiple threads can reach above step. At this point, the singleton implementation looks perfect. But it will still be incomplete without the use of the volatile keyword. This keyword guarantees the happens-before relationship i.e. all the write will happen in the volatile instance before any read of the instance. // Static and Volatile attribute. Up till now, these have been the most widely used approaches for the Singleton design pattern. I am using 5th and the 6th approach in many of my projects as it is easy to understand and implement in the multi-threaded environment. In this section, we will discuss three essential concepts which can break the singleton property of a class and how to prevent them. Let’s discuss them one by one. To overcome this, Enum is used because JVM ensures that the Enum value is instantiated only once and the objects returned by Enum are Singleton in nature. The purpose of using Enum is that its default constructor is private in nature and developers cannot invoke them through the program. Its only drawback is it does not allow the Lazy initialization for the Singleton design pattern. // Implementing the 'readResolve()' method. 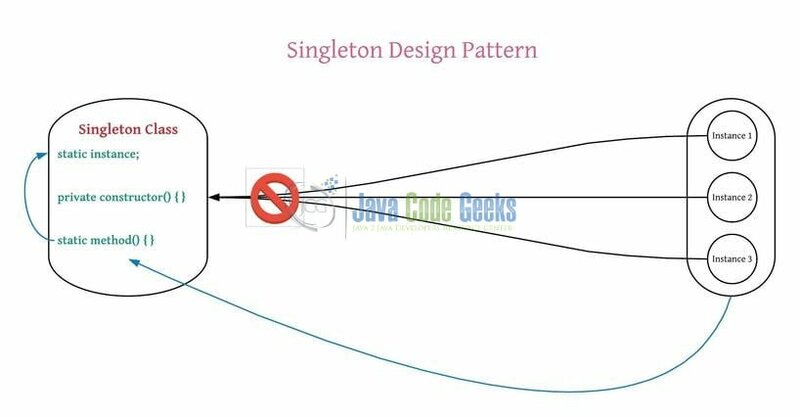 These tips and examples on the Singleton Design Pattern are based on my experience and how I use this design pattern in the Java programming language. This was an example of following the best practices in the Java Singleton Design Pattern. There is no such thing as a true “Singleton” in Java because of the ability to have multiple classloaders no single instance of any give class can be guaranteed. “Singleton” is a proven “anti-pattern” and if your design relies on it, it is fundamentally flawed.